Now available in two effective strengths for optimum antioxidant protection. Q-gel utilizes the state-of–the-art Biosolv process to create a hydrosoluble (water soluble) form of coenzyme Q-10 that is many times more bioavailable than regular, ordinary fat-soluble forms! Q-gel helps to provide nutritional support for the heart and body by stabilizing the integrity of cell membranes and enhancing stamina through improved energy production in the mitochondria. This is especially important to the heart where mitochondria can be found in much higher concentrations than anywhere else in the body. Unfortunately, coenzyme Q-10 levels decline with age which may impact one’s overall state of well-being. Since coenzyme Q-10 (Q-Gel) plays a vital role in energy production, it is considered to be a critical player in both obtaining and maintaining optimum health. 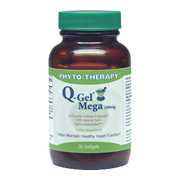 Q Gel Mega 100 mg - is shipped in a discrete, unmarked package. Orders are processed immediately and usually take about 3 to 5 working days to be received. We do ask that you try it for 2 to 3 weeks to feel the full effects. Any information received is used only for order processing and shipping purposes. Your information, such as e-mail address, will never be disclosed to a third party.